Steven Millhauser is the author of some of the most inspired and challenging works of the literary fantastic to come out of America. Steven Millhauser is a writer who seems to be almost entirely ignored by genre critics and little known by fantasy readers. 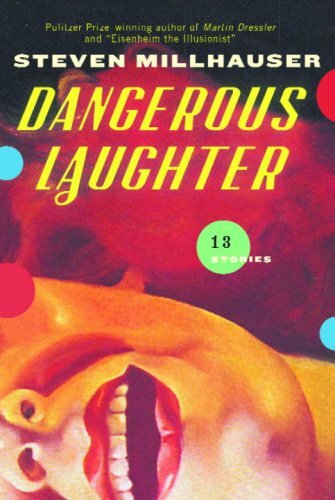 Dangerous Laughter , his sixth collection of short stories (he has also published four novels and a novella, received a Pulitzer Prize, and seen one delicate story turned into a thick-headed film), provides ample evidence why both those contradictory statements should be the case. It also demonstrates why we should be paying more attention to his offbeat, weirdly fertile imagination. Millhauser does not tend to experiment with his prose. The one story here where he does anything unusual is "The Wizard of West Orange," which is written as a diary, articles excised, sentences truncated. But this novelty only serves to emphasise the cool, almost academic precision of the prose in the other 12 stories. But that is not to say he is a conventional stylist; far from it. His favourite voice is first person plural: we do this, we thought that. It is employed in four of the stories here. I cannot, off hand, think of another writer who has used the voice that many times in an entire career, let alone in just one collection. It makes these stories of communal complicity, of collective guilt. Occasionally a narratorial "I" will emerge from the crowded "we," but when it does, it doesn't really achieve individual character; it is just one member of the mob standing round, watching. We are not players in the game, we are not meant to engage with the teller of the tale, but just to shake our heads sagely, as crowds so often do, at the foolishness or sadness of the world observed. Three other stories don't even have this level of engagement, but are rather written as academic articles or journalistic reports. They are, though, still reports of broad popular movements rather than individual actions. Millhauser's narrative strategy, therefore, is at odds with what we normally expect of the fantastic; he keeps his readers at a distance rather than pulling them into the action. Not that there is often that much action; these are cool, detached vignettes of quirks of history, oddities of fashion, or social change. "The Dome" recounts how a few rich Americans start putting domes over their homes, the problems this causes, and how they are overcome, and how the practice spreads so that first communities, then towns, and eventually the entire country are domed. On a smaller scale, "A Change in Fashion" describes the sudden rise and equally sudden fall of a movement in women's fashion. The fashion starts as a movement to cover more and more of the body, until eventually the body itself becomes irrelevant to the shape and pattern of the clothing as ever more extravagant creations are made. At one point, in a typically Millhausian moment of bravura comic excess, the wife of a socialite has a costume that is three storeys high. Not all the stories are as impersonal as these, but Millhauser does tend to write about small moments rather than grand events, and failure is as much a topic as success. One of the most interesting stories here, "A Precursor of the Cinema," ends in failure. It tells of an artist in the last quarter of the 19th century who invents animated paint. None of his work survives, and he disappeared under strange circumstances, but a modern academic scours contemporary diaries and newspapers in an attempt to reconstruct his life. Reports are contradictory (they always are in Millhauser; nothing is ever certain), but it seems that at an early exhibition, visitors saw a still life of a bowl of fruit in which a fly was painted in exquisite detail upon an apple, but at one point the fly took flight and landed on one of the other painted apples in the bowl. As in so many of Millhauser's stories, there follows a familiar trajectory of ambition, obsession, and excess, leading eventually to a massive canvas showing a group of relaxing holidaymakers who seem to become aware of the audience looking at the picture. This trajectory is replicated also in "In the Reign of Harad IV." There are themes and repeated devices that have echoed throughout Millhauser's career, one of the most persistent of which is a fascination with models, miniatures, automata, and animation. "A Precursor of the Cinema" showcases one aspect of this, and "In the Reign of Harad IV" returns to it with a story of the court miniaturist. His job is to furnish the model palace with exquisitely rendered replicas of the real furniture, but he becomes obsessed with his own skill and makes smaller and ever smaller pieces, until in the end he is carving models that are invisible even to the strongest lens. The idea of replicating the real, to a degree that makes it difficult to tell which is real, is another familiar Millhauser motif. It is there in both the last two stories I've discussed, and it is there also in "The Other Town." This concerns a small New England town which, ever since its foundation in the 17th century, has had a doppelgänger just the other side of the woods. A team of officials maintains the other town, making sure it matches the original in every detail, even down to the arrangement of leaves on garden plants, scratches on furniture, discarded underwear in the bedrooms. The only difference is that nobody lives in the other town. One thing to note about "The Other Town" is that it is not overtly fantasy. There is a skewing of reality in the existence of the doppelgänger town, but otherwise there is nothing in the story that could not belong in mainstream fiction. Which is one reason why Millhauser has not generally been taken up within the genre: he exaggerates, distorts, or undermines the real without necessarily going wholeheartedly into the fantastic. In the title story of this collection, for instance, he describes a long, hot summer holiday in which the disaffected youth of a town are so bored that they become addicted to laughter. They form clubs and salons devoted to laughter, and embark on competitions to see who can laugh the longest. Eventually the thrill of laughter wanes and they replace it with a new addiction to weeping. Unfortunately one lonely girl, who blossomed to popularity during the laughing craze, has one last lunatic laugh from which she dies. Now, it is possible to die laughing, but this is hardly a straightforward portrait of reality. Even when the fantastic does enter the story, it tends to sidle in and refuse to take centre stage. One of the best stories here, and certainly the most moving, is "The Disapppearance of Elaine Coleman," in which a middle aged woman returns to her lonely apartment one evening and is gone by the morning. We are presented with several theories regarding her disappearance, but at the end we are left with the suggestion that she spent her life not being noticed by others and so finally just faded away. As a portrait of isolation in the modern world it is beautifully judged, but it is purely down to the reader to decide whether or not anything fantastic really occurred. Such ambiguity between the real and the fantastic is the key to Millhauser's delicate balancing act. "The Room in the Attic," about a youth's curious relationship with a girl in a darkened room, is a mainstream story though it has a fantastic sensibility. The same is true of "Here at the Historical Society," in which the employees of a small-town museum turn their attention to what they call the "New Past," though most others would call it the present. And "History of a Disturbance" tells of a man's sudden disaffection with words, and how encroaching quietude affects his every relationship with the world. There is nothing of the fantastic in any of these stories, and yet you get the sense that they could only have been written by someone who writes within the fantastic mode. Conversely, a story like "The Tower" seems overtly fantastic. It is a retelling of the story of the Tower of Babel (although the word "Babel" does not occur in the story), but it differs in one significant way from the biblical version. The Tower is so great that it would require more than a lifetime to climb from the base to the peak; therefore communities begin to grow up within the Tower, communities with their own concerns detached from the ground below or the heavens above. When the builders finally break through into heaven, neither Millhauser nor his characters are interested in what they find there; most of them just want to get back to their families. In the end it is not divine wrath at the breaching of heaven that brings about the downfall of the Tower, but human neglect because the people who make the Tower and occupy it have other things on their minds. It is, in other words, a work of fantasy that feels as if it could only have been written by a mainstream author. The two remaining stories, which open and close this collection, feel at the same time as if they are the most archetypal Millhauser stories, and the least. Like "The Tower," they feature subjects that are well known but unnamed. You could perhaps argue that such lack of specificity gives them a universality, but it feels to me that it is precisely the fact that we see through the namelessness, identify the precise subject, that makes these stories feel universal. The first, "Cat 'N' Mouse," picks up on Millhauser's fascination with animation. It relates, with careful precision, a series of confrontations between the unnamed Tom and Jerry, picking up on the ludicrous escalations of violence, the distortions of reality (objects that take on the outline of the creature that has run into them), the self-reference (Jerry producing a rubber to erase part of the scene). But alongside this he examines the psychology of the pair, their growing dependence on each other, their identification with each other. Millhauser is a writer who frequently removes the individual from the scene, but this story reverses the process by injecting individuality where it was not before. The collection closes with "The Wizard of West Orange," which is not, despite its title, fantasy, but actually one of Millhauser's relatively rare works of science fiction. The unnamed wizard is Thomas Alva Edison, who was popularly known as the Wizard of Menlo Park and who is buried in West Orange, so the title muddies the process of identification slightly. The story takes place over a few months at the end of 1889 and takes the form of the diary of the librarian in a version of that powerhouse of ideas and inventions, Menlo Park (again unnamed). The librarian becomes involved in testing a new invention, the haptograph, that will do for touch what the phonograph does for sound or the cinematograph for sight. The device doesn't just replicate familiar sensations, it generates new ones, "exotic realms of the tactile" (p. 236), that make the librarian see the world and his life in an exciting new way. But what is exciting for him becomes threatening for others, including, perhaps, Edison himself. It's a story that picks up on many familiar Millhauser tropes: the lost invention, the artisan, the duplication of reality, the questioning of our senses. Yet it does so in a way that seems quite fresh, as if he is using the familiar to explore something quite unfamiliar. This is not, taken all together, perhaps as good a collection as The Barnum Museum or The Knife Thrower , but there is still ample evidence here that Millhauser can create a world more succinctly, more economically, than just about any other writer working today. And when he does so, he deftly pulls our sense of reality out from under us. It is fiction that, in the main, makes you think more than it makes you feel, and it eschews the big, the dramatic, the formulaic; so you can understand why it might not immediately appeal to fantasy readers. But no understanding of the possibilities and opportunities presented by the fantastic can be complete without knowing the work of Steven Millhauser. I'd argue that Millhauser is quite well-known by fantasy readers of the sort who might be expected to enjoy his work. A quick look on the net says he won a World Fantasy Award in 1990 (http://www.locusmag.com/SFAwards/Db/NomLit92.html#3635) and Terri Windling reprinted six of his stories in The Year's Best Fantasy & Horror. I might add that I had wanted to use "The Wizard of West Orange" in this year's Science Fiction: The Best of the Year, but could not get permission (they did not want to -- perhaps contractually could not -- interfere with the collection). Enjoyed your perceptive review very much, Paul. Gavin: apart from the circularity of your argument -- he's known by the sort of people who are likely to know him -- it may be a British phenomenon. But in the decade or so that I have been raving about Millhauser's work I've not come across anyone else who is familiar with his work. Mostly when I mention his name (to people I expect would like his work) I'm met by a blank expression or and "I've heard the name, never read anything though". Certainly the only critical article I know of in the sf journals is by me, and this is the first review I've come across of this book in any sf venue. Rich: since Millhauser has appeared in the Datlow/Windling anthologies, I'm sorry and rather surprised you couldn't get "Wizard" for an sf anthology, it would seem a natural to me. I have liked the Millhauser stories I have read - though they are only the ones that appeared in the Datlow/Windling Years Bests. I look forward to reading more - thanks for the review. Joyce Carol Oates is another writer who has used a first-person-plural narrative voice to some extent, particularly in her novel Broke Heart Blues but in other works as well.